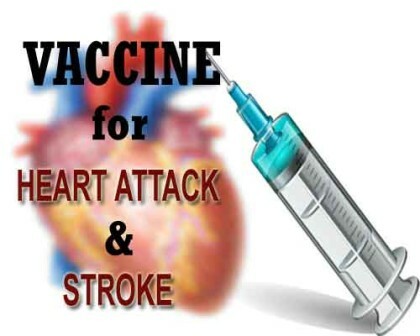 Can we vaccinate against heart attack and stroke?? Development of Vaccines, the awareness of oro-feacal hygiene, and development of anti-biotics in the past has virtually eradicated a number of infectious diseases that were known to decimate populations at one time. This indeed has caused a big impact on mortality and morbidity of mankind in the last century. With the control of infectious diseases, ATHEROSCLEROSIS, that is, deposition of lipids in the arterial wall and its resultant damage and complications, through Heart attack and stroke has become one of the major cause of mortality and morbidity. With the understanding of the immune-mediated inflammatory mechanism of development of atherosclerosis, it is very exciting to think about that this disease can also be controlled by induction of antigen specific immune responses against atherosclerosis by vaccination. When we think about the vaccination, we first need to understand the mechanism of inflammation and its role in atherosclerosis. Both innate immunity which does not require an antigenic stimulation and antigenic specific or adaptive immunity plays a major role in development of the atherosclerosis. One study found, that in mice, who had high lipids, but were deficient in a specific gene known as macrophage colony-stimulating factor gene, which is essential for macrophage survival and proliferation, have markedly reduced atherosclerosis despite severe hypercholesterolemia (1). Similarly another group of studies found that the mice which were having high lipids but were deficient in mast cells had reduced inflammation and lesion formation (2–4). Interestingly, 2 of these studies reported lower circulating cholesterol levels in mast cell– deficient mice, suggesting a link between innate mast cell signaling and cholesterol homeostasis (3,4). The above studies were done for studying the innate non-antigenic inflammation. Compared with the blunt, nonspecific nature of the innate immune system, the adaptive immune response is more specific and develops over time through rearrangement during immune-blast development, generating a wide variety of T and B cell receptors that recognize specific antigens. Given that immune-mediated inflammation is a cardinal feature of atherosclerosis, it is tempting to consider specific strategies to target immune or inflammatory components whereby we can develop a vaccine for atherosclerosis. Some go the studies have focused on this only. Periodontal pathogens have recently gained attention in the research community, as many are found in human atherosclerotic lesions (5) and have been linked to atherosclerosis (6–9). Exposure of experimental animals to P. gingivalis accelerates atherosclerosis formation (10–12), whereas immunization against P. gingivalis attenuates such pathogeninduced atherosclerosis (13). Clinical trial has shown that LDL has got a causative relationship to atherosclerosis which makes LDL and apoB-100 a logical targets for the vaccination therapy.Because LDL is a large, heterogeneous molecule containing a diverse cargo of apolipoproteins, cholesteryl esters, triglycerides, and phospholipids, it would be impractical to use whole homologous LDL as an antigen in a clinically-usable vaccine. Subsequent testing revealed that several immunoreactive peptides, including p2, p143, and p210, resulted in a 40% to 70% decrease in atherosclerosis and reduction in plaque inflammation when used in a vaccine formulation in hypercholesterolemic mice (14,15). Research teams in the United States and Sweden have been using p210 as a prototype antigen in vaccine formulations because the p210-based vaccine has delivered the most consistent athero-protective effects (16–18). The consistent reduction of atherosclerosis after p210 immunization, regardless of how and which form was delivered, strongly suggests that p210 is a promising candidate antigen for potential vaccine formulation for possible future human application. Investigators are now using an innovative approach by identifying a potentially pathogenic CD4þ T cell population and used antigen-specific humoral immunity, determined by the specific signature of these CD4þ T cells to block a pro-atherogenic cellular immune response. Dendritic cell vaccines is also been investigated because DCs are the most efficient antigen-presenting cells, antigen delivery by DCs into the host should provoke an efficient response. Though the research is still in its nascent form, it is very promising and if successful is likely to impact the mankind as a game changer in future. The heart attack and stroke which are the major killer and are the manifestation of atherosclerosis is going to be controlled by vaccination is going to be the major development of the 21st century and like that of the development of antibiotic in past. Given the potential of atherosclerosis as a Giant Killer today, it will be most logical to peruse the atherosclerosis vaccine at the fastest pace. Hoping it comes soon. Rajavashisth T, Qiao JH, Tripathi S, et al. Heterozygous osteopetrotic (op) mutation reduces atherosclerosis in LDL receptor-deficient mice. J Clin Invest 1998;101:2702–10. Sun J, Sukhova GK, Wolters PJ, et al. Mast cells promote atherosclerosis by releasing proinflammatory cytokines. Nat Med 2007;13: 719–24. Heikkila HM, Trosien J, Metso J, et al. Mast cells promote atherosclerosis by inducing both an atherogenic lipid profile and vascular inflammation. J Cell Biochem 2010;109:615–23. Smith DD, Tan X, Raveendran VV, et al. Mast cell deficiency attenuates progression of atherosclerosis and hepatic steatosis in apolipoprotein E-null mice. Am J Physiol HeartCirc Physiol 2012; 302:H2612–21. Rosenfeld ME, Campbell LA. Pathogens and atherosclerosis: update on the potential contribution of multiple infectious organisms to the pathogenesis of atherosclerosis. Thromb Haemost 2011;106:858–67. Armitage GC. Periodontal infections and cardiovascular disease—how strong is the association? Oral Dis 2000;6:335–50. Beck JD, Pankow J, Tyroler HA, et al. Dental infections and atherosclerosis. Am HeartJ 1999; 138(5 Pt 2):S528–33. Buhlin K, Gustafsson A, Pockley AG, et al. Risk factors for cardiovascular disease in patients with periodontitis. Eur HeartJ 2003;24:2099–107. Zelkha SA, Freilich RW, Amar S. Periodontal innate immune mechanisms relevant to atherosclerosis and obesity. Periodontol 2000 2010;54: 207–21. Hayashi C, Viereck J, Hua N, et al. Porphyromonas gingivalis accelerates inflammatory atherosclerosis in the innominate artery of ApoE deficient mice. Atherosclerosis 2011;215:52–9. Miyamoto T, Yumoto H, Takahashi Y, et al. Pathogen-accelerated atherosclerosis occurs early after exposure and can be prevented via immunization. Infect Immun 2006;74:1376–80. Gibson FC 3rd, Hong C, Chou HH, et al. Innate immune recognition of invasive bacteria accelerates atherosclerosis in apolipoprotein E-deficient mice. Circulation 2004;109:2801–6. Koizumi Y, Kurita-Ochiai T, Oguchi S, et al. Nasal immunization with Porphyromonas gingivalis outer membrane protein decreases P. gingivalis-induced atherosclerosis and inflammation in spontaneously hyperlipidemic mice. Infect Immun 2008;76:2958–65. Fredrikson GN, Soderberg I, Lindholm M, et al. Inhibition of atherosclerosis in apoE-null mice by immunization with apoB-100 peptide sequences. Arterioscler Thromb Vasc Biol 2003;23:879–84. Chyu KY, Zhao X, Reyes OS, et al. Immunization using an Apo B-100 related epitope reduces atherosclerosis and plaque inflammation in hypercholesterolemic apo E (-/-) mice. Biochem Biophys Res Commun 2005;338:1982–9. Fredrikson GN, Bjorkbacka H, Soderberg I, et al. Treatment with apo B peptide vaccines inhibits atherosclerosis in human apo B-100 transgenic mice without inducing an increase in peptide-specific antibodies. J Intern Med 2008; 264:563–70. Klingenberg R, Lebens M, Hermansson A, et al. Intranasal immunization with an apolipoprotein B-100 fusion protein induces antigen-specific regulatory T cells and reduces atherosclerosis. Arterioscler Thromb Vasc Biol 2010;30:946–52. Chyu KY, Zhao X, Dimayuga PC, et al. CD8þ T cells mediate the athero-protective effect of immunization with an ApoB-100 peptide. PLoS ONE 2012;7:e30780. Habets KL, van Puijvelde GH, van Duivenvoorde LM, et al. Vaccination using oxidized low-density lipoprotein-pulsed dendritic cells reduces atherosclerosis in LDL receptor-deficient mice. Cardiovasc Res 2010;85:622–30. 0 comment(s) on Can we vaccinate against heart attack and stroke? ?